The grocery store is a really common place for kids to have meltdowns. While some kids are bored, others are overwhelmed by the lights, sound, activity. And many of them see lots of treats they really want to eat! Unfortunately, many parents stop taking their children to grocery stores in an effort to save themselves from the headache and embarrassment of dealing with a temper tantrum in the cookie aisle. Others, however, don't have the luxury of going to the grocery store alone. But don't worry—there are steps you can take to prevent grocery store meltdowns. Before you go into the store or any public setting, establish the rules. Children need to learn what types of behaviors are acceptable in various public settings. So while it's OK to run and yell at the playground, those behaviors aren't acceptable in the grocery store. Talk to your child about the importance of using an inside voice and walking feet in the store. Tell him he needs to walk at all times, stay next to you in the store, and he cannot take items off the shelves without permission. Explain what the positive consequences will be if he follows the rules and what the negative consequences will be if he doesn’t. 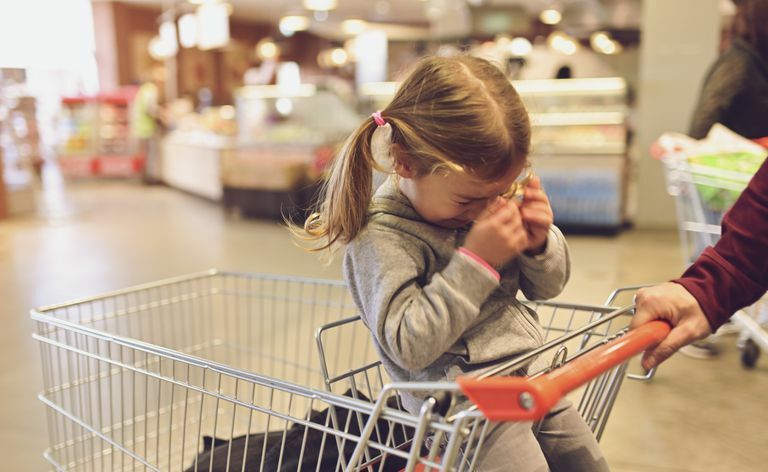 Take steps to prevent behavior problems by making sure your child is equipped to deal with being in the grocery store. Avoid going to the store when your child is hungry or overtired, and make sure he's had some exercise earlier in the day. Once you're in the store, give your child a job. If he's busy, he'll be less likely to get into trouble. Pass grocery items to him, and tell him his job is to place them safely into the cart. Or give him specific items to be on the lookout for in each aisle. When your child breaks the rules, follow through with a negative consequence. Consequences, such as a time-out, can be used if he runs ahead, or isn’t listening. Find a quiet place for your child to serve time-out. Allow your child to serve a time-out on a quiet bench in the store if there is one available. You can even take a break from shopping and go to the car to serve a time-out when necessary. If he begs you to buy him things or throws a temper tantrum just ignore his behaviors. Most kids know that parents get embarrassed in public if they yell or scream so they use their misbehavior as a weapon. Resist the urge to give in to his demands, and teach him that these behaviors are not successful ways to get what he wants. Give your child positive consequences for following the rules. Praise him every few minutes for staying next to you in the store, using walking feet, and helping you shop. You can also offer a tangible reward if he does well. If there’s a special snack he likes; make it a reward he can earn for managing his behavior. A token economy system may also be effective in keeping him on track throughout the store. You could offer one token per aisle or up to one token per minute. Tokens could be exchanged for an item at the store, or can be combined with a token system you are already using in the home. Set up opportunities to help your child practice behaving at the grocery store. Go to the store on a day when you only to pick up a couple of items. Stay in the store long enough to just pick up your items, and help your child practice managing his behaviors during this short trip to the store. Then, help him work his way up to being able to handle a longer outing at the grocery store.